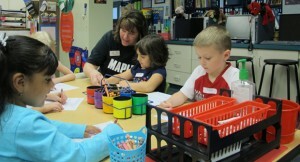 Teacher Janet Craig helps students identify colors during at pre-kindergarten camp at Maple Elementary in Avon, Ind. The major planning stages of the state’s preschool pilot program are getting underway this month. The program the General Assembly passed into law this past session does not go into affect until next summer, but this month the Family and Social Services Administration is announcing participating counties, a legislative summer study committee focusing on the program is holding its first meeting, and fundraising efforts are beginning. The FSSA plans to select in mid-July the five counties selected to participate in the program, after 18 eligible counties submitted applications. Within the counties chosen, money will go straight to families with income at or below 127 percent of the federal poverty level (around $30,000 for a family of four). They then enroll their child in an already existing preschool program, whether its at public schools, charter schools, or child care facilities ranked a Level 3 or 4 on the Paths to Quality scale. The education summer study committee will exclusively look at the program and how it can function in the future. Some of the items expected to be on their agenda is studying what accountability measures other states use for preschool, funding of a more widespread program, tools for parents of children enrolled in the program and the economic benefits of early learning programs. Fundraising also begins this month for the $1 million to $5 million in private matching funds that is part of the program’s budget. The FSSA is appropriating an additional $10 million. The private matching funds will go straight to families who then choose what provider to use, and no stipulations can be on that money. All of this will continue throughout the year as the program and its participants continue the planning process.